1827	 The South Level Drainage and Navigation Act set up the South Level Commissioners, who were given the right to dredge the River Lark below Swales Reach at Isleham, and to collect tolls from Prickwillow to Littleport to recompense them for the cost. They now took over the River Lark below Isleham. 1829	 Susanna Palmer, the proprietor of the River Lark Navigation, died in 1829, aged 93. The Lark navigation now passed into the hands of Sir Thomas Gery Cullum. In practice he seems to have been managing it on her behalf for some years past. 1830	 In 1830 the course of the Great Ouse was changed by drainage works by the new South Level Commissioners. Further work on the lower reaches of the River Lark also changed the course of the Lark navigation from its 18th century route. The old Roman four mile long canal from Isleham to Prickwillow was bypassed and began to dry up and disappear. A new cut was made on the Great Ouse, together with a new junction with the River Lark. In 1830 Pigot's published their first Directory of Suffolk. This listed each town in the County, describing their history, local gentry and professions, and their tradesmen. Bury is described as "on the western bank of the river Bourne or Larke." 1831	 Sir Thomas Gery Cullum the elder died in 1831, and his son, The Reverend Thomas Gery Cullum, now became the eighth, (and last) baronet of Hardwick, inheriting all his father's property and estates. It was the Reverend Sir Thomas Gery Cullum who carried out major improvements on the Hardwick House and Estate, and left his "TGC 19??" plaques on his new buildings and the improvements on the River Lark. In April 1831 Joseph Priestley published his book entitled "Historical Account of the Navigable Rivers, Canals, and Railways, of Great Britain". He included an assessment of the River Lark, which can be read by clicking on Priestley's Assessment. 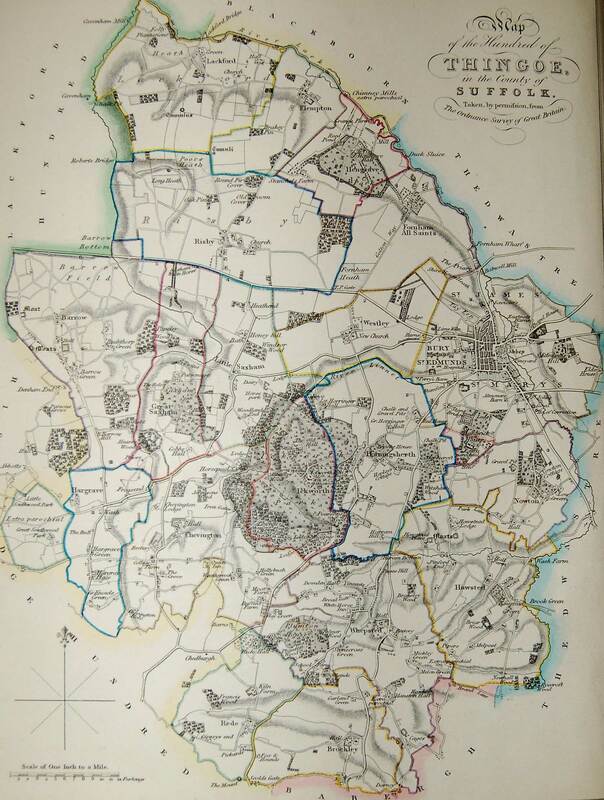 "The town of Bury is pleasantly situated on the river Larke, and from its delightful walks, clean streets, and well built houses, and from the urbanity of its inhabitants, forms as pleasant a country residence as any small town we know of." "About a mile from the town the river Larke becomes navigable to Lynn, whence coals and other commodities are brought in small barges." One important use of the River Lark was the transport of the heaviest of building materials. In a report which might remind us of the stone transported from Barnack to build the Abbey centuries earlier, The Bury and Norwich Post and Suffolk Herald of 6th April 1836 referred to the construction of a new Catholic church. "A number of immense blocks of Ketton stone (many of them weighing 3 – 4 tons each) have been put on barges at Wansford to be used in building a large Catholic Church at Bury St Edmunds." Ketton and Barnack are only a few kilometres apart, and Ketton stone is smoother than the shelly Barnack stone, which in any case, was largely worked out by now. Both sites depended upon dragging stone to the River Nene for access to markets. 1838	 In 1838 John Deck of Bury published the work by John Gage entitled "History and Antiquities of Suffolk, Thingoe Hundred". This was a review of all the estates around Bury within the Hundred of Thingoe. This area contained 18 parishes and would survive as an administrative unit as Thingoe Rural District Council until 1974. You can trace the course of part of the River Lark as far as it lay within the area of Thingoe. The Fornham Wharf is clearly marked together with Babwell Mill, Ducksluice etc.. The Cherry Ground Lock is not named, but it can be seen marked on Gage's map, just upstream of Lackford Bridge. This shows that some type of lock existed on the crescent shaped bend of the river before Cullum's improvements dated by his plaque of 1842. Both the River Lark and Linnet are named on this plan. 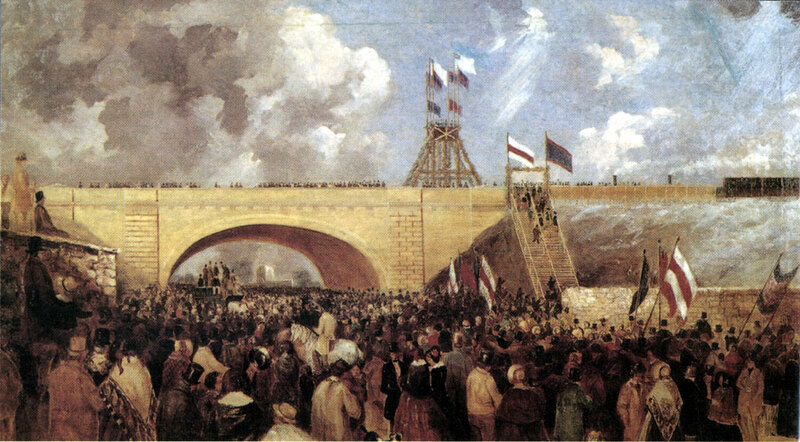 The old Eastgate Bridge over the River Lark was pulled down in 1838. The East Gate itself had long gone, pulled down in 1763. The current bridge was built in its place, but not completed until 1840. Some alternative arrangements must have been in place while the bridge was being replaced. 1840	 Some improvements were undertaken to Eastgate Street in Bury and the Marquess of Bristol subscribed to the works. The local building firm of Steggles built the white brick bridge which still crosses the River Lark. Iron railings were erected along the riverside there, reused from the Market Cross. This was the first time that there was no traffic actually fording the river. Up to 1840 there had always been a combination of bridge and ford in Eastgate Street. By this time the Lark Navigation was owned by the Reverend Sir Thomas Gery Cullum, who had become the 8th baronet in 1831. As well as the improvements that he made to his own estate at Hardwick, Sir Thomas also set about renovating the Lark Navigation. His distinctive "TGC 18??" plaque was affixed to many of his buildings and improvements, both in Bury and on the river. 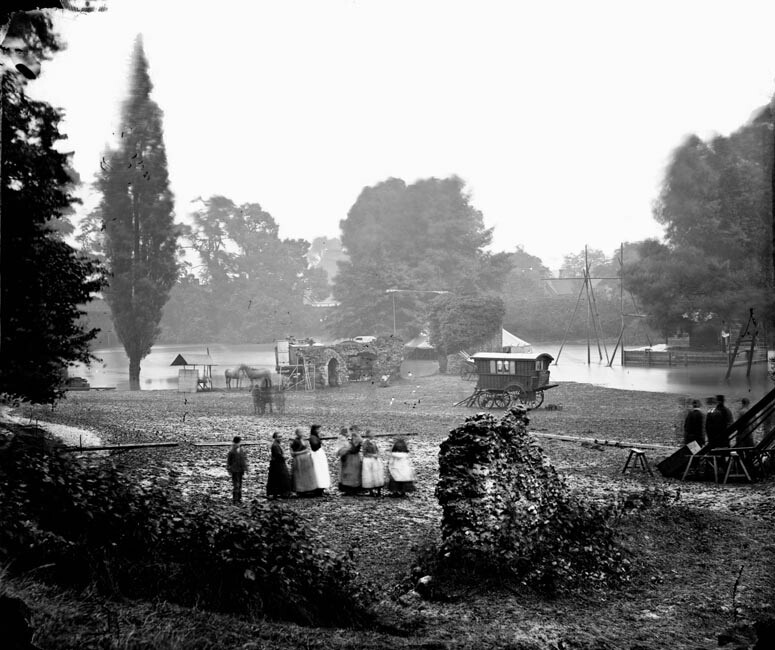 1842	 Some of Sir Thomas Cullum's major improvements to the River Lark were finished in 1842. These two cottages at the foot of Tut Hill in Fornham All Saints, were built by him, and have his "TGC 1842" plaque on their front wall. One may have been occupied by his lock-keeper/lengthsman, who managed this part of the river on his behalf. The Cherry Ground lock was built by Sir Thomas, and once had a plaque stating "TGC 1842". This lock is now within the West Stow Country Park, and has been fenced off because the brickwork is crumbling away. It currently bears an Anglian Water sign calling it Cherry Tree Lock. 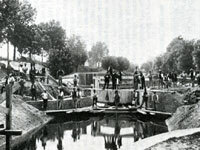 The Cherry Ground lock was a key part of the improvements to the river. It was built on a bend where the lock was fashioned into a crescent shape, much longer and wider than the usual locks on the Lark. It could hold 8 gangs of lighters at one time if necessary, lined up side by side. Such a lock justified a full time resident lock keeper. So Sir Thomas Cullum also built River House nearby for the use of the lock keeper, or lengthsman, as he was also known. This was completely demolished in 1979 as part of the preparations for the opening of the West Stow Country Park to the public. The house had stood in ruins for years, and was unsafe. According to D E Weston, this house also bore the Cullum plaque, "TGC 1842". 1843	 By 1843 the 80 commissioners appointed in 1817 had found their number greatly diminished by old age and death. Fifty new commissioners were appointed in 1843. In the same year the founding act of the River Lark dated from 1699/1700 was published together with the Act of 1817, in a small book. 1844	 By 1844 the River Lark navigation was thriving. White's Directory of Suffolk for 1844 recorded that barges went on a daily basis from Mildenhall Bridge to Bury St Edmunds and Kings Lynn. White's recorded that there was much greater traffic to and from Lynn than previously. Tolls had been cut from 7/- and 8/- a ton to 4/6 and 5/- a ton by Sir Thomas Gery Cullum, who was also responsible for major improvements along the river. 1845	 Records show that some 10,000 tons of goods and coals were sent from Kings Lynn to Bury St Edmunds by barge in 1845. By 1852 this trade would have dwindled to almost nothing. 1846	 The River Lark navigation enjoyed its last 12 months of prosperity until disaster arrived at Bury St Edmunds in the shape of the railway. In December, 1846 the long hoped for railway line arrived at Bury St Edmunds from Ipswich. A railway line now linked London, Colchester, Ipswich, Stowmarket and Bury St Edmunds. In December, 1846, when the first 90 tons of coal arrived in Bury by train, its price fell by ten percent. It arrived to temporary platforms just east of the bridge over Out Northgate Street, and the current station had hardly been started. Nevertheless there were street celebrations and fireworks to welcome this great event. The railways gave the town an easy export route, as well as bringing goods in cheaper. The old established brewing and malting industry could now be joined by other newer undertakings. Merchants who had relied upon the Lark Navigation for coal, could now import it by rail. Coalyards would now be installed on the Station Hill in Bury to receive the rail shipments. 1847	 In 1847 men 'raising gravel for ballast' for the barge traffic on the navigable River Lark, found skeletons and numerous cremation urns at West Stow. The term ballast probably referred to its use for road making purposes. It was transported away by barge. 1848	 A railway link was established from Cambridge to Newmarket, but there was as yet no link to Bury from this direction. Since 1831 the Reverend Sir Thomas Gery Cullum had been proprietor of the Lark Navigation Company, inheriting it from his father, also called Sir Thomas Gery Cullum. This included the wharfage and associated businesses on the Mildenhall Road, just outside the boundary of the Borough of Bury St Edmunds at the time. Both Sir Thomas the elder and Sir Thomas the younger had invested large sums of money and enthusiasm into the River Lark. The railway had already caused a drop in river traffic. Cullum could clearly see that the railways would result in a continuing loss of trade on the canals, and he needed to take some action to alleviate the situation. He opened negotiations with the Eastern Union Railway Company to try to guarantee himself some income from the Navigation. Bury St Edmunds corporation finally got wind of Cullum's intentions. On December 25th the Town Clerk of Bury wrote to Cullum to ask him to cease negotiations with the Railway, and to meet a deputation from the Council. Cullum replied that it was now too late for him to withdraw from a conclusion of his agreement with them. 1849	 In this year the Eastern Union Railway company agreed to pay the Reverend Sir Thomas Cullum £500 a year to let the Lark Navigation decay for ten years. Cullum also agreed that he would not lower the river tolls in order to compete with the railway, and that the tolls, less commission, would be paid to the Railway Company. The agreement started on 1st January 1849, and despite the protests of the Bury Corporation, the deal was done. The corporation's legal advice was that this was contrary to the original Navigation Act. However the river continued to be used to haul coal to the Fornham Wharf until 1890. The cut from the River to the Wharf survived until the 1970's, and the river was known as the Coal Rivers by local boys into the 1960's. By the end of the 20th century the cut was filled in to provide parking for a transport and haulage business. Only a small ditch remains to collect outflow from the surface water drains on the Mildenhall Estate, and deliver it to the River Lark. Even this ditch is diverted several yards to the north of the course of the original cut. "The wind blew down the river with a cutting blast as my turn came to wade into the flood; but after I had walked a few steps, and noted the people on the ferryboat, and in boats, and on either shore, I felt as if heaven and earth and hell might all gaze upon me, for I was not ashamed, then and there, to own myself a follower of the Lamb. My timidity was washed away; it floated down the river into the sea, and must have been devoured by the fishes, for I have never felt anything of the kind since. Baptism also loosed my tongue, and from that day it has never been quiet." Baptisms were regularly carried out at Isleham up to the early 1970s. 1851	 The coming of the railways had a profound effect upon the commerce of the River Lark. This navigable river extended from the Great Ouse river, through Mildenhall and upstream as far as the Fornham Wharf. This wharf was within the parish of Fornham All Saints, upon land owned at the time by Sir Thomas Gery Cullum. Much of the land at the Fornham Wharf had been coalyards, and most of the tonnage on the river had been coal. The Ipswich to Bury railway line had been delivering coal right into Bury St Edmunds at Northgate Street since December 1846. Thomas Ridley had rented a coal warehouse from Sir Thomas at Fornham Wharf, but he no longer required its use. 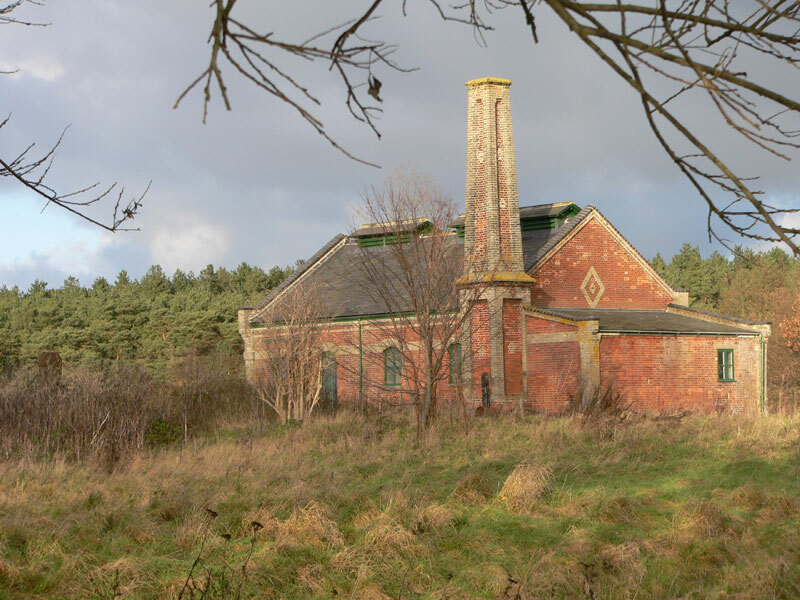 Sir Thomas probably did not have the money, or the inclination, to redevelop the site himself, so he let it to Robert and John Dunnell, who built a large new Malt House on the site. "Sir T R Gage, Bart, is lord of the manor (of Fornham All Saints), but part of the soil belongs to Sir T G Cullum, Bart, on whose estate, at the south-west angle of the parish, 1 mile N. of Bury, is a commodious Wharf, at the termination of the Lark Navigation, ... and a large Malting House, built in 1851." The Directory for this parish failed to identify a maltster, but a James Footer was recorded as a "carpenter, Wharf", presumably indicating that his business took place at the Wharf. The wharf was served by a cut from the River Lark which then turned 90 degrees to run parallel to the Mildenhall Road. This cut survived in a silted up form until the 1960s, but was filled in to provide land for development. Nothing now remains of the Wharf, which now lies beneath the UPS distribution depot, but the Maltings was used for this purpose until at least the 1960s. 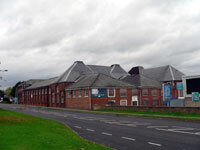 Later it became a furniture warehouse, finally known as Kingsbury's, but in 2008 it has stood empty for several years. Some iron ties at the northern end of the building still display the inscription, "TGC 1851". 1852	 By 1852 most of the old river trade had transferred on to the railway, even though the railway from Bury ran to London via Ipswich. This was completely the opposite direction to the coal trade which had flourished by river to Kings Lynn. A few businesses along the river therefore chose to continue to be supplied by river. These would have included the watermills, some of which used steam engines by now, and possibly the large maltings located on the Fornham Wharf. 1853	 In 1853 Sir Thomas Gery Cullum mortgaged many of his assets connected with the River Lark Navigation. He mortgaged the Fornham Malting estate, raising £8,000 on it. It consisted of a malthouse, storehouse, granary, stable, yard, pumps, cisterns, kilns and furnaces. Robert and John Dunnell continued as sitting tenants of the Maltings. Sir Thomas also raised mortgages on the nearby Friary Estate and Tollgate Estate. The Bury St Edmunds Corporation continued to be worried about the state of the River Lark. They took Counsel's Opinion on the legality of Sir Thomas's agreement with the Railway Company. Counsel wrote that, "the agreement is altogether illegal and void." He also gave the opinion that it was illegal for Sir Thomas to have made improvements up to Fornham Wharf without continuing to Eastgate Bridge, the legal end of the Navigation. However, it required an aggrieved party, such as a shareholder, to take the matter to the Courts. The Council wrote to the Clerk of the Navigation Company to obtain information about the agreement and the income now being received. The Clerk and Solicitor was John Greene of Bury St Edmunds, and he gave some information but refused to give other details. One piece of interesting information emerged when the corporation asked for the toll structure by the ton of coal. The toll for coal brought from Mildenhall upriver to Fornham Wharf was set at 4/2 per chaldron. John Greene calculated that this was equivalent to 3/2 per ton of coal. In fact, if a chaldron was actually equal to a short ton, and slightly less than a long ton, then the toll should have been calculated as either 4/2 or 4/8 per ton, depending upon the definition of a ton at the time. "the sluggish state of the stream arises from want of trade upon it, not from any neglect by the proprietor." Cullum was 75 by now, but still active in business. 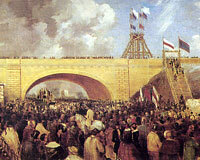 1854	 The council tried to press Sir Thomas Cullum to extend the Lark Navigation up to the Northgate Railway Bridge in Bury St Edmunds, despite its failing profitability. When the existing railway link from Cambridge to Newmarket was extended to Bury St Edmunds in 1854, the price of coal in Bury became even cheaper. At Bury's Northgate Station further works had to be carried out to accommodate the new line from the west, but coal could now arrive from the Midlands via Cambridge, or by sea via Ipswich. This prompted Sir Thomas to offer to sell the Lark Navigation to the Council of the Borough of Bury St Edmunds. They did not take him up on it. "In consequence of an arrangement between Sir T G Cullum and the Railway Company, the traffic on the Lark Navigation is now much diminished." During this period of the sudden decline of the River Lark navigation, Sir Thomas Gery Cullum died, aged 77, on February 3rd, 1855. He had made many improvements to the river in the 1840s, but the new railways had largely destroyed the barge trade. In December 1855 Thomas Prentice proudly announced that his new Railway Wharf was now in operation to bring best Staveley coal to Bury St Edmunds for 19/6 per ton. Delivery in town would cost another 1/- a ton. Railway Wharf was not on the River Lark, but was his name for his new coal depot on Station Hill, served by rail, not by water. 1856	 Following the death of Sir Thomas Gery Cullum in 1855, his widow, Lady Ann Cullum, was now ready and willing to sell the Lark Navigation to the Borough Council of Bury St Edmunds for £8,000. By this date the river was only used for trade up as far as Lackford. The Borough Council had John Croft draw up plans for an extension of the Navigation up to Northgate Railway Bridge, and published a prospectus for a new company to manage and improve the river. The Bury St Edmunds Navigation company tried to raise £20,000 by issuing 2,000 shares at £10 each, but the project failed, with few, if any, takers. 1857	 The competition presented to the River Lark by the railways can be illustrated by the example of the Borough Surveyor for Bury St Edmunds, when he sought quotes for bringing in roadstone to Bury St Edmunds. He found that he could get stone delivered from Ipswich by rail for 4/9 a ton. Stone brought from Kings Lynn by river would cost 4/6 a ton, 2/3 was asked for tolls, and a further 1/- for delivery from Fornham Wharf to the town. This made a total of 7/9 delivered by river and 4/9 by rail. 1858	 Lady Ann Cullum had used a Bury St Edmunds auctioneer and land agent, called Henry Newson in her attempts to sell off the River Lark in 1856. In 1858 she made a conditional sale of the Navigation to Henry Newson and James Lee, the latter a timber and coal merchant and Maltster of 27 Risbygate Street in Bury St Edmunds. The price agreed was £7,050. payable in full within a set term. 1859	 Following the agreement made 10 years earlier with the railways, the Lark Navigation was now in a badly decayed state. The agreement now expired in 1859. This meant that any new operator could reduce tolls to compete with the railways, but would need to spend money to repair the dilapidations of the last decade. Henry Newson and James Lee could now try to make the river a going concern again. The Bury Paving Commissioners had adopted significant provisions of the Public Health Act of 1848 and the local Government Act of 1858 relating to sewers, drains and privies. New houses in Bury now had to be built with drains and a water closet. The Commission had established a sewage works at the Tay Fen, but in the 1850's it was causing concern because of smells and the usual problems of sewage disposal. However, most people still had nightsoil collected by cart, or stored it in the yard for sale to farmers. Something was needed a bit further out of town and a site was identified at Bell Meadow. 1861	 The partnership of Newson and Lee had failed to pay the agreed price for the Lark Navigation, and so, in 1861 ownership reverted to Lady Ann Cullum. 1862	 Still desperate to sell the Lark Navigation, Lady Ann Cullum had it auctioned off in London. The Navigation was sold for £4,500, half its original build cost, to James Lee, a local coal and timber merchant. He planned to bring in coal cheaper than the railway, but first it needed a massive investment in the canal. Lee died on September 8th, 1862, before anything came of his plan. James Lee left the Navigation to three men whom he must have thought were most likely to make something of it. These were William Biddell of Hawstead, Robert Boby of Bury, and John Jackson of Fornham. The first two men repudiated the bequest, leaving John Jackson to be sole beneficiary. 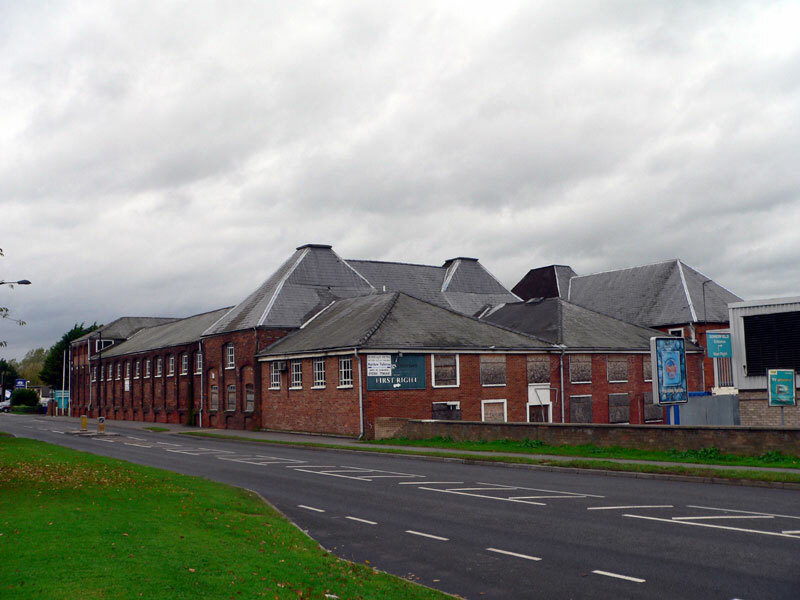 1863	 In 1863 a sewage works was opened at what is now called Bell Meadow in Bury. It was the first attempt in the town to deal with the collective disposal of foul water. It soon led to complaints. Bell Meadow is adjacent to the River Lark near the Tollgate Inn. Meanwhile a civil engineer called G R Burnell published a full and detailed survey of the River Lark, and a study of proposed improvements. It seems that James Lee had commissioned this before his death. Burnell's study stated that he had made his calculations for income on the assumption that Bury St Edmunds could consume 25,000 tons of coal a year. He also expected to gain trade from the Clunch lime being extracted at Isleham, and from the flints being dug at Icklingham for the repair of roads in the fens. He also expected that the corn trade from farms along the river could be increased. The works required to extend the river included a reduction in the water surface from Babwell Friars Clough to Northgate by 18 inches, the height of the Babwell Clough. This would be achieved by dredging. All of the cloughs and staunches were to be removed. "Nowadays the system of cloughs and staunches is entirely abandoned on any river destined to support a constant navigation, as it is only capable of producing a temporary flush of water." He planned to use dredgers to deepen the river bed instead. He had calculated that from Northgate to Mildenhall Sluice the river had a fall of 71 feet 4 inches. He would accomodate this by 13 locks, and would abandon seven staunches. John Jackson, now the sole owner of the river by inheritance from James Lee, does not seem to have adopted this report. 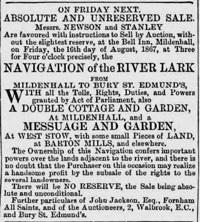 1867	 In August 1867, John Jackson started to sell off the assets of the Lark Navigation. 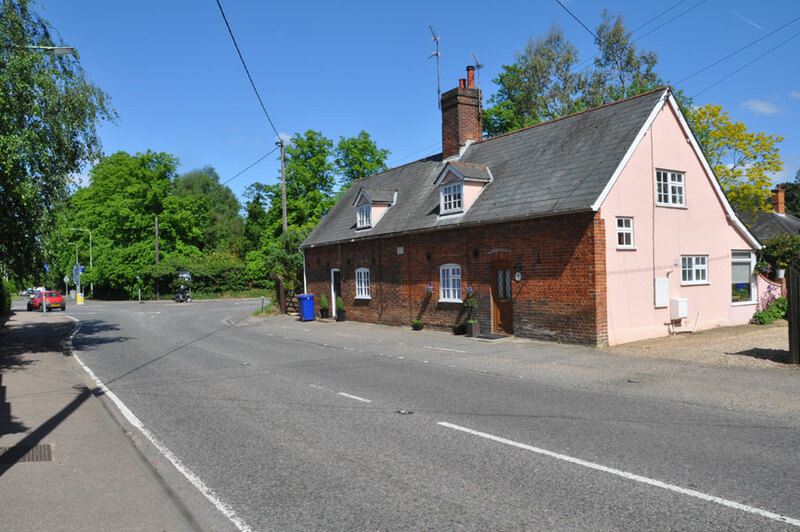 The cottages and weighbridge were sold at auction. There was little interest and it proved difficult to sell. 1868	 John Jackson now sold the Fornham Wharf back to Lady Ann Cullum for £600. He proceeded to sell off all the land belonging to the River Lark Navigation Company, retaining only the river and its towpaths. 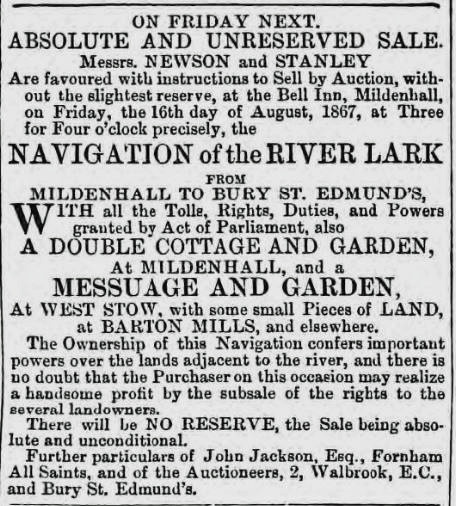 1871	 On July 13th, 1871, John Jackson finally sold off the remaining rump of the River Lark Navigation to Charles Kirby of Great Cornard for £55. A bill was introduced into Parliament called the Ely and Bury St Edmunds Railway Bill, which included a clause designed to close down the Lark Navigation. Following protest from Bury St Edmunds corporation, this clause was omitted. 1875	 Charles Kirby sold the River Lark Navigation rights to Frederick Woodbridge of Kentish Town for £60. Woodbridge seems to have done nothing for the river. 1879	 Very wet weather meant that this was a year of disastrous harvests, some fields were not finished until October. The bad weather holding up the harvest is illustrated here by flooding in the Abbey Gardens in July, when the showmen's gathering was flooded out. 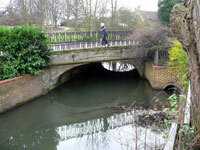 1882	 The well known footbridge across the river Lark, located in the Abbey Gardens, was built in 1882. It was built for the use of scholars at the new home of the King Edward VI Grammar School, which was being built at the time in the Vinefields. "The River Lark as a water highway, at least the upper portion of it is practically closed. Within a few years the traffic extended to Fornham, now, above Mildenhall, a barge is never seen. The whole course of the river is choked with weeds, on which, during floods, heavy deposits of soil have accumulated, which renders navigation impossible..."
At Bury St Edmunds, public opinion also was pressing the council to do something about the river. 1883	 Following public pressure, the Mayor of Bury St Edmunds, Cllr Thomas Ridley, authorised Mr Scott of the council to seek out the present possessor of the plans and books of the Lark Navigation and to purchase them on behalf of the council if they could be obtained at a reasonable price. 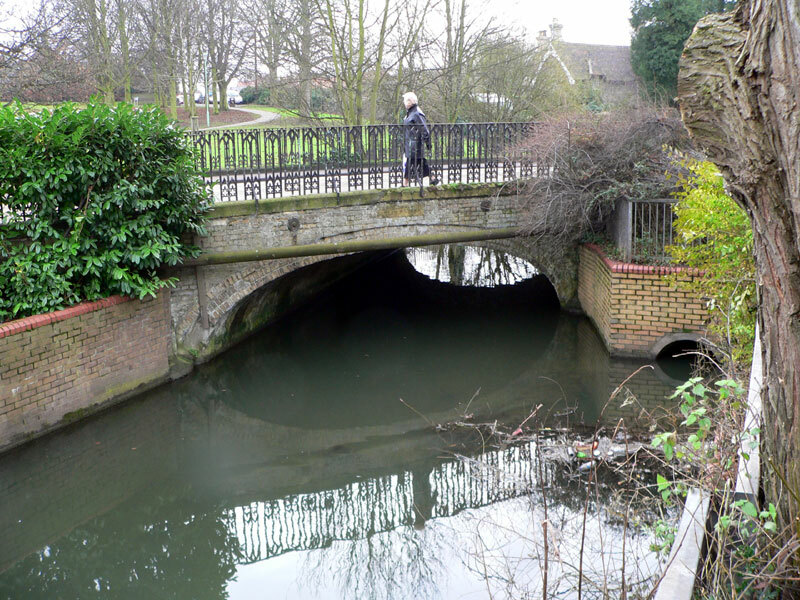 The council was considering not only the repair of the existing navigation, but its extension from the Fornham Wharf as far as the railway bridge over the river behind the ruined St Savious Hospital. It would take another two years before serious progress was made. 1885	 In January 1885, Mr Scott reported to the council that he had found a civil engineer, called Mr Gilmour, who would manage the setting up of a new company to carry out the works. He required a guaranteed return of 3 or 4% a year, which he wanted the council to underwrite. The council, of course, wanted to limit the input of its ratepayers' money. Luckily for the council, the Hervey family of Ickworth decided to become involved. Both the Marquis of Bristol, Frederick William John Hervey, and Lord Francis Hervey, MP, supported the proposals for a new and improved River Lark Navigation. However, outside interests now owned the navigation rights, and an impossible price of £10,000 had been mentioned to buy them back. The Herveys realised that legislation would be needed to get anything done at a reasonable price. 1886	 Some 112 acres at West Stow were purchased by the Borough Council in 1885, for a new sewage farm to be constructed to serve the town of Bury St Edmunds. Building took place from 1885 to 1887. This would replace the works built in 1863 at Bell Meadow in Bury. Like most sewerage schemes, it relied on gravity to provide the flow, and so the pipes were laid, as far as possible, along the river valleys. A pumping station was built by the River Lark at West Stow, at the end of the line, to pump effluent up into the site from a tank at the end of the pipeline. This is the only building now remaining from this work. The expression sewage 'farm' came about because 20 acres of the site were to be used to grow crops such as tomatoes and black currents to be irrigated from the outfall. Several improvements and changes were needed within a decade to improve its operation. However, ownership of this land adjacent to the river Lark, raised the possibility of river improvements at the same time.
" Inspection of canals: Whenever the Board of Trade are, through their officers or otherwise, informed that the works of any canal are in such a condition as to be dangerous to the public, or to cause serious inconvenience or hindrance to traffic, the Board of Trade may direct such officer or other person as they appoint for the purpose to inspect the said canal and report thereon to the Board of Trade, and for the purpose of making any inspection under this section the officer or person appointed for the purpose shall, in relation to the canal or works to be inspected, have all the powers of an inspector appointed under the M1 Regulation of The Railways Act 1871." 1889	 With the legislation in place which could force a reluctant canal owner to bring the navigation up to proper standards at considerable cost, the owner of the Lark Navigation was willing to dispose of his asset, which had now become a potential liability to him. In June 1889, Mr F Woodbridge sold the Lark Navigation to the Marquis of Bristol and the Mayor of Bury St Edmunds for just £26.5.0.. They were acting on behalf of the new company which was in the process of being formed, to be called "The Eastern Counties Navigation and Transport Company Limited", or the "ECN & TCL", as their new lighters would soon be blazoned. The Herveys ensured that the first enquiry by the Board of Trade under the 1888 Railway and Canal Traffic Act was held into the River Lark. In August of 1889 the Board of Trade Enquiry opened in Bury St Edmunds. Both their Lordships were in attendance as were representatives of the Bury St Edmunds Borough Council and all the riparian owners on the river. There were no objections to the ECN & TCL taking over the running of the navigation and its subsequent improvement. 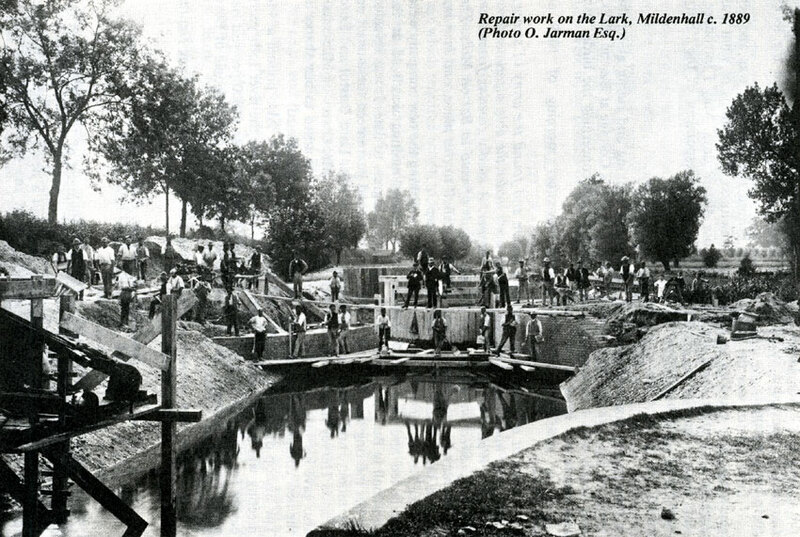 Things moved swiftly and improvements to the river Lark at Mildenhall began straight away in August 1889, as did the construction of the new wharf at St Saviours. The dredging and canalisation of the river from Fornham Wharf to St Saviours had already begun in July 1889. Plans were drawn up for a new bridge to carry the Fornham Road by the Tollgate Inn, and for a new lock just upstream of the bridge. The contractor was Mr James Wilson. blank In October a steam dredger was in use on the Mildenhall section, and the locks there were being repaired. By November, the river was nearly completely excavated from Mildenhall to Barton Mills. "In many parts the river is 50 feet wide and 6 feet deep" wrote William Howlett, who recorded progress on the river as a correspondent for the Bury Free Press and other local newspapers. Despite all this progress on the river, the Eastern Counties Navigation and Transport Company Limited was only formally established in November 1889. This haste may have contributed to the disputes with the builders which erupted in the next two years. On December 7th the Company called a public meeting at the Guildhall in Bury St Edmunds, to offer its shares to the general public. Lord Bristol and Lord Francis Hervey had already bought £1,000 of shares each. Other notable shareholders already in place were the Bishop of Bath and Wells, (Lord Arthur Hervey), and Mr C Quilter MP. The Mayor announced that the company had appointed a Mr Thomas as its General Manager. 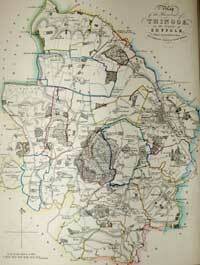 1890	 By January 29th William Howlett reported the progress on works from Isleham to Bury. From the Lee Brook junction, where work started, to Cindall Hills old ferry house, the work was partially complete. The dredger had increased the depth at the West Row ford to over 5 feet, so people were demanding a bridge. The Turf Lock at Mildenhall had been repaired. 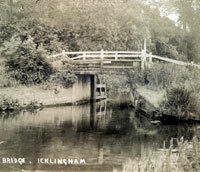 At Icklingham the Temple Bridge was awaiting reconstruction. Because the intention was to use steam tugs to replace the horse for towing lighters, some bridges needed to be raised to allow clearance for the funnels of the tugs. Lackford Bridge was already being heightened. The Cherryground Lock, which had been built by The Reverend T G Cullum in 1842, could hold 8 whole gangs of barges at one time. Repairs had been carried out. Locks at Fullers Mill, Flempton and Chimney Mills had all been repaired. They were still awaiting new lock-gates. However, at Ducksluice lock at Fornham, the lock was complete with gates. Despite this good progress, there were still seven miles of the river which was as yet untouched, and 15 locks and gates remained to be fixed. William Howlett had been so impressed with the work of the navvies in the cold of 1889, that he had organised a public subscription to give them all a meal of roast beef and plum pudding. 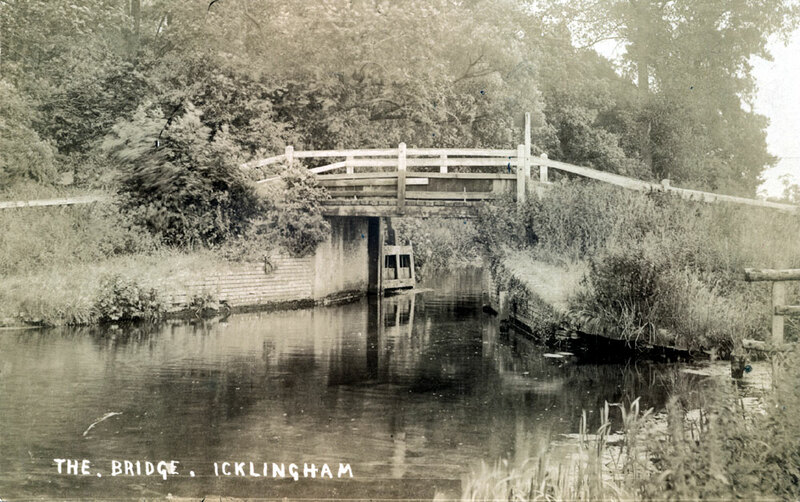 The river improvements had great public support, and the dinner for 100 men took place at The Red Lion in Icklingham on 21st February 1890. Fishermen were pleased that the works were carried out with great care for the fish. Charles Wing, the landlord of the Red Lion was even considering building his own wharf for the delivery of coal, stone and corn.